The Irukandji jellyfish is a type of box jellyfish, which are amongst the most poisonous animals in the world. The Jellyfish is one of the created kinds, which was created on the 5th day of creation along with other sea creatures. 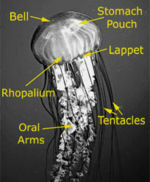 It has the same organ structure as the box jellyfish. Except that it is 2.5 cm in diameter  . With four tentacles, one from each corner of its "box" , each is up to a meter long . Nevertheless stinging cells, which fire poison drenched harpoons, are found all over the body besides just the tentacles. Like the box jelly fish the Irukandji has nematocysts . Irukandji are found farther out to sea where there is deeper waters . Mostly in the Great Barrier Reef around north Queensland in Australia . 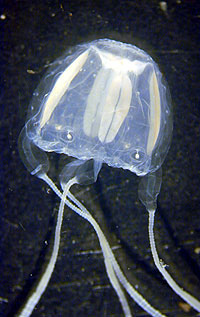 Also like box jellyfish Irukandji jellyfish also eat small fish and other organisms. Jellyfish warning sign. Cape Tribulation. Queensland, Australia. 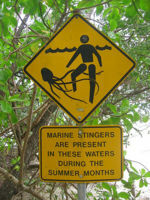 If you ever experience the misfortune of being stung by an irukandji jellyfish, you will experience Irukandji syndrome. Drenching the stung appendage with vinegar will inhibit the stingers from releasing more venom , but researchers are not sure how that process happens . Furthermore there is not an anti-venom discovered at this point in time . But 32% of 116 victims were released from the hospital within 24 hours . It has been proven that a magnesium transfusion helps alleviate the symptoms to some extent . There are six other [jelly fish] that cause [Irukandji syndrome]. People don’t normally feel the initial sting , but within 5-45 minuets symptoms will become present but on average it takes 1/2 hour  . The victim then experiences extreme muscle cramps , shooting pains over the body especially in the chest and stomach, also up and down the arms   also vomiting may insure , also convulsions may insure. Some so violently painful even under the full dose of morphine, one victim commented, “that she could rip her skin off” . This page was last modified on 21 May 2010, at 01:37.